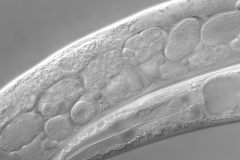 The wealth of available methods and the easy handling make C. elegans an ideal object for all kinds of studies and theses (Internships, B.Sc. Thesis, M.Sc. Thesis). Usually these studies are parts of larger research projects in the lab. Our current projects are centered around the lab’s two main research interests: tumorgenesis (cancer) und neurodegeneration (Parkinson’s Disease). Our main focus currently lies on membrane dynamics: these processes are important for the creation, release and reuptake of vesicles and organelles, e.g. synaptic vesicles and neurotransmitter release, endocytosis, phagocytosis, sorting processes inside the cell, autophagy and mitochondrial dynamics. These processes are discussed today as the main factors in the development of both cancer and neurodegenerative diseases. 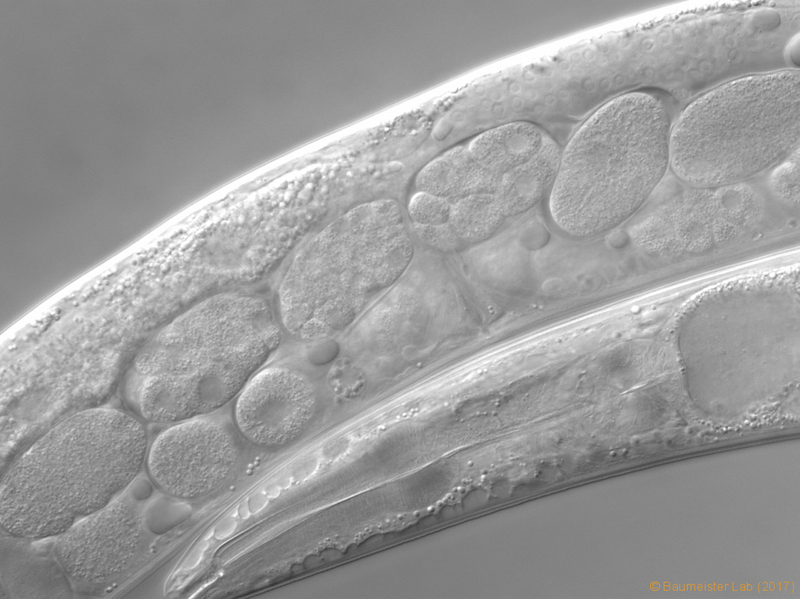 All our C. elegans projects deal with genes/mechanisms that are conserved in humans. This is true for the genes involved in insulin/IGF- as well as mTOR-signalling, SGK-1 (serum-and-glucocorticoid-inducible kinase 1), PINK-1, Parkin and LRRK2. • imaging (of gene expression, cell dynamics, developmental processes).